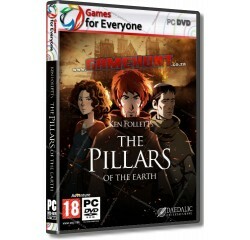 Ken Folletts - The Pillars of the Earth (Book1 to Book 3) - R160,00 : Game Hunt, Where we lead, others follow. Based on Ken Follett's world-bestseller, 'The Pillars of the Earth' retells the story of the village of Kingsbridge in a whole new interactive way. Play as Jack, Aliena and Philip and change the events of the book through exploration, decision-making and dialogues. One of the most successful novels of all time, now adapted as a three-part videogame series. Change events from the novel and influence the fates of its characters. Follow an epic of war, conspiracies and romance spanning over 30 years. Three different playable characters: Jack the outsider, Aliena the noblewoman and Philip the monk. Brings the 12th century to life with over 200 handpainted backgrounds. Fully animated in a unique 2D style. Optimized for use with controller and mouse. Orchestral Soundtrack by the FILMharmonic Orchestra, Prague. Full voice over in English and German, featuring Glen McCready as Philip, Naomi Sheldon as Aliena and Cody Molko and Alex Jordan as the young and adult Jack. With a special appearance by Ken Follett as the voice of the Cantor.